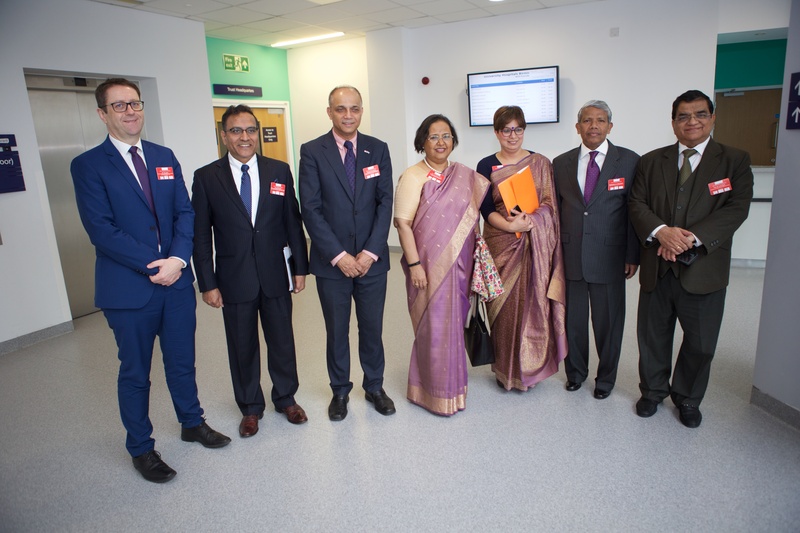 Birmingham, in the heart of Britain, saw an unprecedented ensemble of over 120 key healthcare experts from India and UK, converge at the renowned ‘Queen Elizabeth Hospital’ to discuss the potential areas of collaboration and identify effective models to take the relationship to the next level. Chairing the day-long Conference, Rt Hon Jacqui Smith, Chair UHB Hospitals NHS Foundation Trust welcomed delegates at one of UK’s largest hospital, setting the tone of the conference by emphasising how the partnership between the two countries can be mutually beneficial. High Commissioner of India to the UK, H.E Ruchi Ghanashyam assured the conference that both Governments are committed to support healthcare collaboration, and stressed that India and UK need to work together to address current challenges in this sector. She elaborated that India has been able to provide world class medical treatments at the most competitive rates. Dr. Indu Bhushan, CEO of National Health Authority of India focussed on the ‘Ayushman Bharat’-the world’s largest government funded healthcare insurance scheme which will benefit over half a billion people. He explained how it’s a game-changer, and how these revolutionary changes in the healthcare landscape of India offer opportunities for international healthcare organisations both in the public and private sector. Dr. D. S. Rana, Chairman, Sir Ganga Ram Hospital, New Delhi, highlighted the fact that the 98 years old institution, also happens to be the largest medical teaching facility of its kind in the country, in the private sector. He further stressed that his institution was keen to partner with its British counterparts to address the challenge of shortage of skilled manpower in both countries. Mayor Andy Street, Mayor of West Midlands, Neena Gill, Member of European Parliament, Preet Kaur Gill, Member of Parliament promised the much needed political support to the partnership of NHS with other health systems of the world, including with India. They were unanimous in suggesting that NHS’s partnership with its Indian counterparts will be mutually beneficial. Other dignitaries who spoke on the occasion were Jayesh Ranjan, IAS, Principal Secretary to Government of Telangana, India who also co-chaired the session on Pharma and MedTech along with Madhukar Bose, Deputy Head of Healthcare, British Department of International Trade. This session focussed on the opportunities for British companies to invest in India, and take advantage of the healthcare revolution in the country where the size of the Healthcare industry is exected to grow to USD 280 Billion by 2020. Dr. Shashi Baliyan, Managing Director, Clearmedi Healthcare shared the story of his several ventures in India, which are importing European business models to upgrade the quality of healthcare delivery in India. Other speakers of the day included Chris Loughran, Deputy Chair, Greater Birmingham & Solihull LEP, Julia Ross, CEO for BNSSG Clinical Commissioning Group, Prof. Kiran Patel, Medical director, NHS England – West Midlands, Prof. Philip Baker, Dean of Medicine, University of Leicester and Lakshmi Kaul, Confederation of Indian Industry (CII). Dr Ajay Rajan Gupta shared the progress made by IUIH which is the single largest project of its kind envisaging the setting up of 11 greenfield hospital facilities in India in partnership with NHS. The Conference was organised by the High Commission of India through the Consulate General of India in Birmingham, and was supported by University Hospitals Birmingham, NHS Foundation Trust, Greater Birmingham and Solihull Local Enterprise Partnership (GBSLEP) and Confederation of Indian Industry (CII). Dr. Aman Puri, Consul General of India, Birmingham in his closing remarks announced that this Conference is likely to become an annual feature. The conference succeeded in bringing together domain experts from both countries to discuss the challenges faced and opportunities available for both India and UK in the healthcare sector. At the same time it attained its objectives of providing a forum to widen and enrich the healthcare research and innovation debate, addressing workforce challenges and holding meaningful discussions on the scale of exchange, current approach and possible solutions in this arena at a time when the Healthcare sector of both countries is at an inflection point.